New Zealand remain in pole position heading into round four in Langford, Victoria. With New Zealand edging closer to Olympic qualification after winning in Atlanta on Sunday, the Kiwis will be keeping a close eye on the draw for the next round of the World Rugby Women's Sevens Series, which was announced today. Langford, Victoria in Canada hosts round four of the draw on 18 and 19 of April. New Zealand, who beat USA 50-12 in the final of the third round in Atlanta, have been drawn in Pool A with England, Fiji and Spain. Simon Middleton’s England will be hoping to improve on their performance in Atlanta, after they were easily beaten by Russia in the quarter finals, 24-0. Australia are now joint second in the standings with Canada after they were knocked out of the Cup proceedings in Atlanta by a hungry USA team. They’ve been drawn in Pool B along with France, Brazil and China. Pool C is headlined by the hosts Canada who had an impressive showing in Atlanta, finishing the tournament in third place and winning many new fans with their excellent semi-final display against New Zealand, where a narrow conversion miss saw them lose 24-22. They’ll be joined by an ever-improving USA team, who now lie fifth in the standings, along with Russia and South Africa. Commentators Sean Maloney from Fox Australia, Wille Lose from Sky Sport New Zealand and NBC/Universal’s Bill Seward from the United States had a bird's-eye view of the action in Atlanta at the weekend. All three agree that the intensity, skills and competition has made yet another step up over the last few days. “We saw some real quality here. When we got to the quarter and semi-finals, every team was capable of knocking over the other,” said Lose. 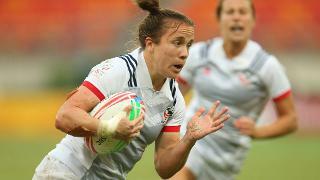 “Even though the final was a blow-out, I think USA, having been to a final, will be better for it. Seward thinks USA’s experience will move them into the big leagues now. “They got two big wins against Australia and Russia and they came up against a great team in the final, but they've moved up in the standings and the next round is in Canada, which will be interesting." Maloney thinks the race for the third and fourth place in the series standings will lead to some more top quality rugby. "Tournament to tournament, the level has gone up so much so it means teams have to be on their game. The race that's on now for the third and fourth place is going to be epic, as I think New Zealand and Australia will finish in the first and second place." Lose added: "The quality of this series is great for the game. Already in New Zealand there are a lot of players coming from track, netball and other sports that see a gold medal potentially at the Olympic Games. New Zealand will go from strength to strength and I think they will get even better." A scary thought for many.